The summer is over. At least such is the message the UK media have been force-feeding us for the past couple of weeks, as if taking special pleasure in going over the topic over and over again. And assuming – rather wrongly so – that there ever was a summer in the first place. Weather complaints aside, 2011 by all means brought a decent summer. Work was productive. Several good friends have visited in London. And I have revisited not one or two but three places I call home: Riga, Frankfurt and Helsinki. Which of course meant reunions with many friends for life. Moreover, following the mistakes I made in the previous two years – first, that of spending the entire summer in the UK in 2009 and, second, travelling abroad on almost EVERY weekend in the summer of 2010 – this year has undoubtedly seen a better balance. At its most extreme, this July I spent as many as two consecutive weekends in the comfort of my London home. Ignore the idyllic side though; the end of second such weekend had me nearly climbing the wall with boredom. The magic balance had been found: alternating travel weekends might well be the perfect solution for the summers to come. As we are already in September, it is a good time to recap some of the most memorable moments of the summer departed. Looking back, I see three distinct occasions on which I found myself literally bursting with excitement. Of course all three happened during my travels; as goes below. Most of you are sick and tired of reading about the Faroe Islands in this blog. Please have your understanding at the ready – for I ain’t finished here quite yet. I recently wrote about my second visit to the Faroes. 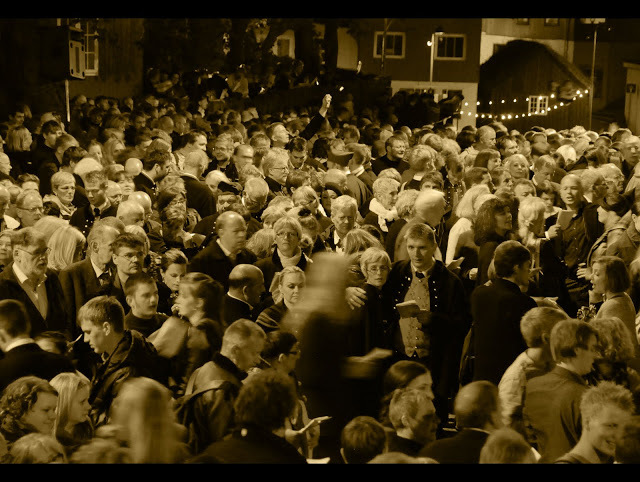 The trip was timed with the archipelago’s largest national festival, the Ólavsøka. The culmination of which was the midnight singing on Tórshavn’s central square. Over ten thousand people gathered for the occasion, opened the lyrics sheets they’d been thoughtfully handed out (yes, that makes over ten thousand copies) and took a deep breath. After which the singing began. Countless voices instantly filled up the atmosphere; shivers ran down my spine. I will not lie that I had never heard anything similar before: my homeland, Latvia, is huge on public singing and gathers choirs from all over the country to perform together at the Song and Dance Festival every five years. That makes tens of thousands of professional singers all chanting in unison for a week. At a venue minutes away from my parental home. No joke. And yet the Faroese midnight singing hypnotised me from the first sounds. Every song was catchy in its special way, but it was Aldan, the remake of Annika Hoydal’s 1977 classic, that ignited me instantly. Come the chorus, and the entire square nearly exploded in a passionate poetic outburst. Sissa meg! (Calm me down! ), echoed all around, as if to defy its literal meaning. I climbed the fence overlooking the square and joined in the thousand-fold choir, shaking fists in the air for a fuller effect. It felt like I was going to war to save the world. It was powerful. It was the highlight of the night. It was the highlight of my summer. Or I’d simply had too much beer. Highlight Number 2: We swing by night! My passion for photography is not a secret to anyone. Even before I’d first touched my Nikon, however – in the depths of the dark age – I dreamt of taking one particular shot. Every detail was framed neatly in my mind. The composition would feature a merry-go-round swing. The sun setting in the background would light up the skies with that soft glowing light. People would be sitting in the chairs; but, against this magnificent backdrop, only their flying silhouettes would show. Such was my dream photo. It wasn’t entirely unrealistic: about a year ago, I came across an image somewhat similar to the one I had in mind. The author, TJ Scott, has disabled reproduction of his work on other websites, so I cannot display it here. If you care, have a look on the author’s Flickr page instead, and you will no doubt agree with me. The work of genius. The timeless inspiration. My dream photo come true – except, of course, that it wasn’t mine. Sadly, there aren’t many sunset-facing swings in London, and my dream picture seemed to have no chance of coming to life – until, last June, friends invited me to visit them Stockholm. It was my seventh visit to the Swedish capital and I had by then covered most of the serious, educational sights. 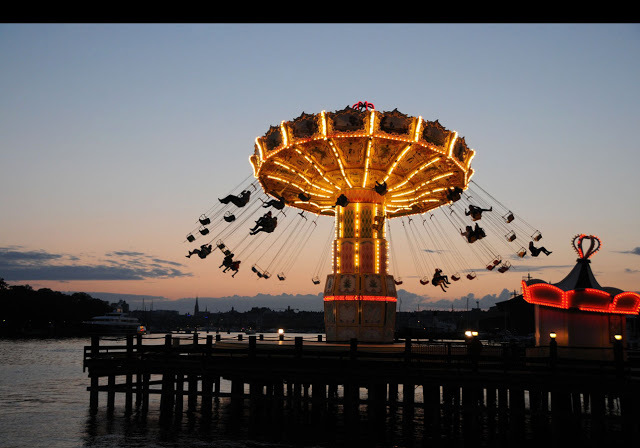 Enter Gröna Lund – Stockholm’s best known tivoli packed with attractions for every age and adrenalin threshold. Before embarking on a ride, I headed to the waterfront – Stockholm is built on 14 islands and water is literally everywhere – to admire the city’s evening skyline. A cruise ship was departing for the big seas in front of me. I followed it with my eyes for a while – after which I glanced lazily towards the city. Swirling swings, check. Blazing sunset, check. Silhouettes of people in chairs, check. The added bonus of Stockholm’s skyline in the background – and Baltic Sea breathing gently below! My dream picture suddenly got animated. I dropped everything I was holding, clutched Nikie and snapped away. The rest of the world didn’t exist anymore. Perhaps attracted by my speechlessly overflowing excitement, other passers-by soon gathered around with their cameras. Some took pictures of me and Nikie. But we barely noticed them. All we could focus on were the black human silhouettes against the last accords of a magnificent pink sunset. Just like in that dream photo in my head. My long summer holiday this year was to the northern latitudes of Norway. On a chilly July morning, I reached the Arctic Circle and headed steadily to the place where I had dreamt of visiting for years – the Lofoten islands. Out comes Hurtigruten. The sea line connecting coastal Norwegian cities between Bergen and Kirkenes, Hurtigruten is more than just another means of getting from A to B. A voyage onboard one of its ships is nothing short of an exploratory adventure; a platform for admiring the unique natural beauty of Norwegian seascapes. 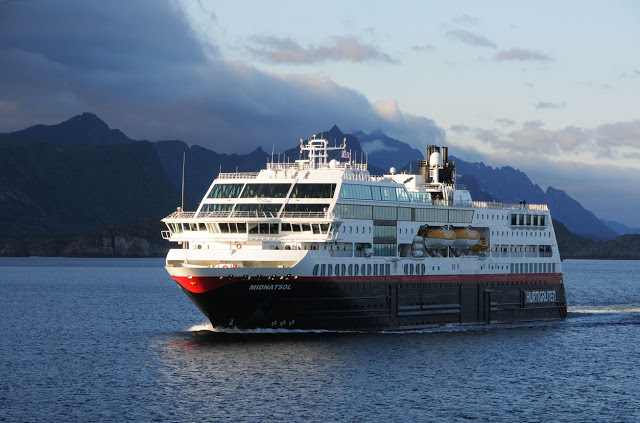 It is not for nothing, after all, that Hurtigruten is often described as the World’s Most Beautiful Sea Voyage. And the Lofoten islands are among the journey’s undisputed highlights. Out of the 13 ships making up the Hurtigruten fleet, ours happened to be named after one of Norway’s most stunning natural phenomena – Nordlys, for the Northern Lights. But there was little hope of spotting the dazzling aurora borealis in July. A brisk thought passed my mind that Midnight Sun would have made a more appropriate name for our ship. As if by magic – not even a minute had passed before a little dot appeared on the horizon, growing as the distance between us gave way. Another Hurtigruten ship was emerging, magically and unexpectedly, from the dramatic rugged wall made up by the Lofoten peaks. So majestic was the sight of a large coastal ship sliding along the dimly troubled waters of the Norwegian Sea that I momentarily lost the ability to speak. My eyes slid down and stopped by the ship’s name. It was Midnatsol. As if someone had heard my earlier wish and happily obliged: the real Midnight Sun was heading towards us. The Northern Lights and the Midnight Sun were approaching each other. And, just in case the observers had any doubts about the solemnity of the moment – and indeed the surrounding scenery – the next minute sorted it all out. Abiding by the Hurtigruten signalling convention, Midnatsol went on to blast three long signals, which our ship duly echoed. The air suddenly became almost solid with sound. 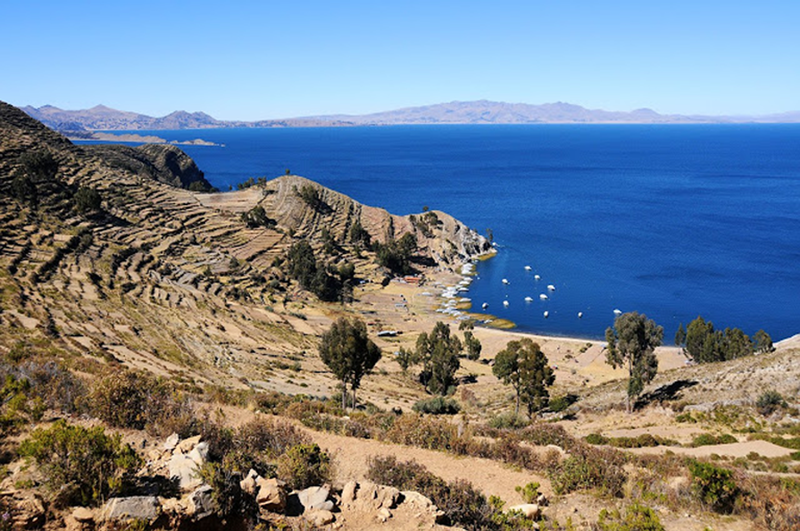 We stared at each other for a fraction of a second in a shocked sensation – after which, without an invitation, rushed to the port of the ship and energetically waved at our fellow passengers across the water. They were doing the same on the other side. I could almost hear the many hearts pumping around me. It was a beautiful, unforgettable moment. The summer may be over. But its best memories live on. And, more importantly, we have a wonderful autumn to look forward to. Have a good one! 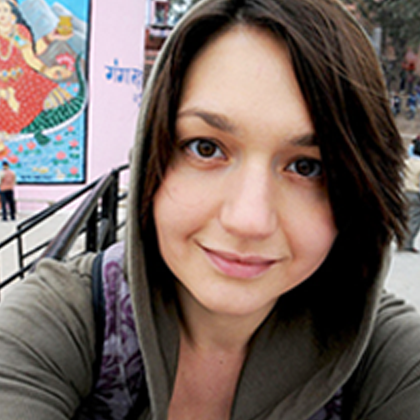 Oh my goodness, Hanneke. This is crazy! I usually stream Dagsrevyen every day but missed it last night. That's too bad about Nordlys : ( Will post some pictures of it on my Flickr tonight.